What They Say....The New York Times bestselling author of A Long Time Gone now explores a Southern family’s buried history, which will change the life of the woman who unearths it, secret by shattering secret. 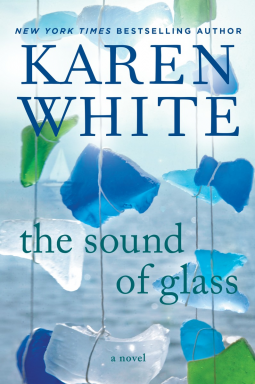 What I Say....First of all, let me say that I have enjoyed a few of Karen White's books, One thing that I like about her is that although she is a best selling writer, her books don't seem to follow a formula (I'm looking at you, Janet Evanovich). On Folly Beach is a WW2 mystery that is told in flashbacks. The House on Tradd Street is a ghost story. And The Sound of Glass is about domestic violence and how many lives it touches through the generations. The book starts out with a plane crash on an ordinary night. I actually had to go back and reread the first chapter because it didn't seem to be making sense to me. It started with such a bang that I was taken off guard. While the mystery stayed as an undercurrent throughout the story, the reality of every day life took over. Merritt is trying for a new beginning, and only wants to be left alone, but life just isn't working that way. She is suddenly saddled with a stepmother she hates and a half-brother she doesn't know, along with her dead husband's estranged brother showing up all of the time. Merritt is a domestic violence victim, although she has no idea how far back in her family this pattern actually goes, and Gibbes is also a child of domestic abuse, culminating in a covered up murder. But neither of them really understand how these experiences have affected their every day lives and their ability to love. As the story went on, I was having a hard time connecting the dots of the mystery, but by the end it tied itself up. The crime scene nutshells were a little creepy, but this author does creepy well. My verdict, another winner by Karen White. Thank you NetGalley and Penguin Group and NAL for giving me a copy of this book for review.